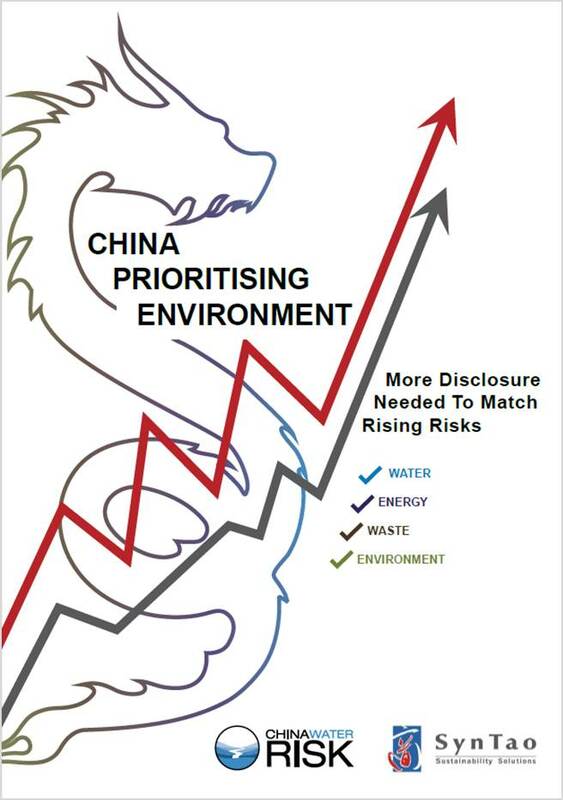 16 May, 2018 – China Water Risk and SynTao release their new joint report titled, “CHINA PRIORITISES ENVIRONMENT: More Disclosure Needed To Match Rising Risks“. With China moving to mandatory environmental disclosure we thought it was a good time to take stock on where Chinese companies are on the Environmental aspect (E) in ESG disclosure. Environmental and water related risks have consistently been in the World Economic Forum’s Top Five Global Risks for the last eight years. Troublingly, climate change exacerbates these risks. Already their persistent and material impacts are shifting the regulatory landscape, which in turn is creating mainstream risks. It follows then that the finance sector should be working on identifying, valuing and managing these risks. While action to do this has started, the assessments are dependent on the underlying disclosure, which is still largely inconsistent and not decision relevant. China, recognising the immediacy of water and environmental risks is moving towards mandatory environmental disclosure for its exchanges for which it has a tentative 2020 deadline. Given this, it seemed a good time to take stock on environmental disclosure in China. CWR’ & SynTao’s report seeks to do this by analysing disclosure on the environment and three subcategories (energy, water & waste) by Chinese companies from 2012 to 2015 as per SynTao’s MQI database for six sectors. Summary – in English here and Chinese here. “China is leading the move to mandatory environmental disclosure. It has to, in order to embed environmental and water risk into its credit lending policies, as it has said it wants to. While these are positive objectives, as found in this report, there is still a way to go before disclosure from Chinese companies meets this and reflects the rising risks. At the heart of many supply chains, what happens in China has global implications.